Kiley is currently the Chancellor and Chief Financial Officer for the Diocese of Fall River, charged with managing the temporal affairs of the Diocese. Prior to this role he was the Director of Strategy and Financial Planning for the Archdiocese of Boston in charge of the Central Operations budget, Pastoral Center facility, and more. Kiley has worked in Catholic Church Administration for over 25 years and was awarded the Bishop Cheverus medal by Cardinal Seán O’Malley in 2009. Mount is the Associate Provost for Academic and Professional Affairs at MCPHS University in Boston. She is an award winning, widely published investigator and has led research projects funded by the National Institutes of Health, the U.S. Food and Drug Administration, and the Centers for Disease Control and Prevention. Over the past 15 years, Mount has held a series of academic leadership positions at the University of Wisconsin – Madison, Northeastern University, and MCPHS University. Vitti is the founder and CEO of Healthcare Financial, Inc., a Quincy-based company that assists individuals in obtaining health care benefits, and the parent of a current Cushing student, Frankie. A devoted entrepreneur with over 30 years of experience, Vitti is a nationally recognized expert on healthcare reform, revenue enhancement, and Medicaid and SSI/SSDI eligibility and enrollment. Simmons took ownership of Delphi Construction in 2001, then still a small firm focusing primarily on healthcare construction. Under his direction, Delphi has grown to become a visible leader in multiple construction markets with more than 80 full time employees. Simmons now serves as CEO/Executive Chairman of the firm which was recently named one of the 25 largest General Contractors in the state by The Boston Business Journal. Abdouh is a Senior Vice President, Commercial Banking for Eastern Bank where he has worked for over 25 years. Abdouh is responsible for providing clients with financing and cash management solutions with the highest level of expertise and service. Some of these services include loans for commercial real estate; working capital needs; equipment; ESOP, and acquisitions. Abdouh completed the Executive Leadership Institute with the Boston Chamber of Commerce. He resides in Plymouth with his wife Cristina and daughter Sofia. Chandler is the Statewide Family Engagement and Collaboration Coordinator at Massachusetts Department of Public Health (Early Intervention) and the parent of a current Cushing student, Faith. Prior to her role with DPH, Chandler served as the Director of Family and Community Engagement at the Federation for Children with Special Needs. Chandler was appointed to the Massachusetts Statewide Rehabilitation Council Executive Board in 2014. Cochrane currently is a Senior Managing Director at FTI Consulting in charge of their Power and Utilities group in Boston. Cochrane also serves on many high level boards, and prior to joining FTI held the position of Executive Vice President for National Grid where he worked from 1981 to 2013. Cochrane’s son Michael attends Cardinal Cushing Centers’ employment training program for adults with disabilities, South Shore Industries (SSI). Cramer has more than 25 years of leadership experience in large non-profit organizations in the education, health, and social services sectors. Cramer most recently served as Associate Dean for Administration and Finance at the Bouve College of Health Sciences at Northeastern University, holding responsibility for financial and administrative operations, as well as the establishment and implementation of policies to direct the administration of areas including financial, human resources, information technology, space and facilities. Harris is a seasoned entrepreneur and investor with 20 years’ experience working in the high tech industry. He is the Founding General Partner of Eniac Ventures — one of the world’s leading seed funds with over $175 Million under management. Eniac invests in a number of successful startups such as Airbnb and Boxed. Harris’ brother, Traves, is a graduate of Cushing’s school program and is currently receiving supports from Cushing’s programs for adults with disabilities. Joanne is the founder of Joanne Jaxtimer Consulting, a small firm that focuses on providing non-profit organizations with fund development, relationship management, and stakeholder engagement services. She is also a Founding Partner of CJR Strategic Transition Partners, a consulting firm that specializes in assisting non-profits with executive leadership transitions, organizational and development assessments, strategic planning, and executive search. Jaxtimer most recently served as BNY Mellon’s Co-Head of Global Philanthropy. She is a Trustee of the Mabel Louise Riley Foundation, a member of the Governor’s Commission on Intellectual Disabilities, and the Massachusetts Women’s Forum. She was featured in the book Boston Inspirational Women. Joanne’s son, Michael, participated in Cushing’s culinary training program. Kiley is a Partner in Risk Advisory Services at RSM US LLP and has previously served as Chair of Cushing’s Board of Directors. Kiley is a CPA with broad experience advising clients about managing and controlling their business risks, including Enterprise Risk Management, Service Organization Control (SOC), Sarbanes-Oxley, and Internal Audit. McGoldrick and her husband George own Black Rock Country Club in Hingham. In addition to volunteering in the classroom alongside Cushing’s students, McGoldrick has served on Cushing’s Capital Campaign Steering Committee and the Development Committee. She chaired the Town Hall Building Committee in Cohasset from 2016 – 2018. Previously, McGoldrick was the Vice Chair of the Cohasset School Committee and from 2007-2013 served on the Board of the Cohasset Education Foundation as Grants Chair, Vice President, and President. Sr. Helene has served as a member of the Board of Directors for the St. Ann Center for Intergenerational Care. She has also served as a cook at the Motherhouse, Cardinal Stritch University, and as a food service director at the St. John Villa Restaurant, where she was also a director of vocational services. She is part of the Land Use Committee at St. Francis Convent that is working on building a bio-diverse Urban Forest, larger garden areas, establishment of bees, and in particular the restoration of 2.5 acres of wetlands. 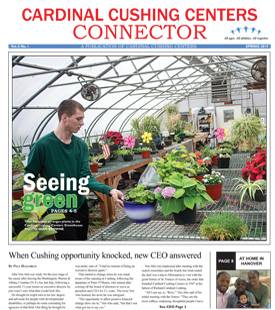 Sr. Helene helps Cardinal Cushing Centers stay connected to its Franciscan roots. Nash began her career in the finance industry, starting as a public finance analyst at E. F. Hutton in NYC. She then moved to Boston where she worked at Bank of Boston and Fidelity Investments. Jody’s daughter Sophie is currently a resident at Cardinal Cushing Centers. Jody is dedicated to ensuring students like Sophie are able to succeed in Cushing’s programs for years to come by serving as Chair of the Capital Campaign Committee. Jody’s guidance has helped the Capital Campaign reach new heights. Rivkind, Partner at Rubin and Rudman LLP, primarily represents individuals and business entities in the areas of taxation, business law, banking and commercial transactions, real estate, estate planning, and non-profit organizations. Rivkind was included in The Boston Globe’s 2012 Edition of Top Rated Lawyers and previously served on the Board of Directors for Triangle, Inc. for eight year. He served as President for three years. Yoshida is a Partner at Yoshida & Sokolski, P.C. and a parent of Brent, a Cushing graduate who is currently receiving supports from Cushing’s programs for adults with disabilities. Yoshida’s past work experience was primarily with a major accounting firm in Boston, before moving to the current firm which he bought in 1985. Since 1988, he has operated as Partner/President of Yoshida & Sokolski, P.C. Dave has also served on the board of Directors of Special Olympics Massachusetts and the Professional Center in Andover.